Charles & Colvard, Ltd. (NASDAQ: CTHR), the original and leading worldwide source of created moissanite, today announced the debut of princess and baguette Forever One™ moissanite gemstones at JCK Las Vegas. Loose stones in these fancy cuts are available to distributors and retail partners through Charles & Colvard's wholesale division, as well as to customers through the company's e-commerce website www.charlesandcolvard.com. Charles & Colvard now offers eleven shapes in Forever One moissanite: Asscher, baguette, cushion, emerald, hearts and arrows, oval, pear, princess, radiant, round and square brilliant. For the first time, all eleven shapes are on display at the Charles & Colvard booth. Charles & Colvard has participated in JCK Las Vegas, North America's largest annual trade event, for 17 years. This event brings together over 30,000 of the world's most influential industry professionals to discover what's new and next in the fine jewelry market. Charles & Colvard is exhibiting in the bridal section (Bayside Level 1), booth B57004. "Our new princess and baguette gemstones are the perfect addition to our Forever One fancy shape assortment," said Charles & Colvard Senior Director of Merchandising Jose Ayala. "All of our gemstones are expertly cut to yield maximum fire and brilliance, and I'm excited to have them all on display in our booth. The mix of shapes and sizes we offer come together to create distinctive and timeless jewelry. Our booth showcases the many beautiful and creative designs that are possible with moissanite." With a refractive index of 2.65-2.69, moissanite exhibits more brilliance than diamond and is among the hardest minerals on the earth—more durable than sapphire, ruby or emerald. Forever One is the highest quality lab created moissanite that eliminates the artificial distinctions between value and beauty and offers socially responsible fine jewelry to the consumer who is thinking beyond traditional choices. Every Forever One gem comes with a limited lifetime warranty that protects against damage to the stone and any changes in color, clarity or brilliance. 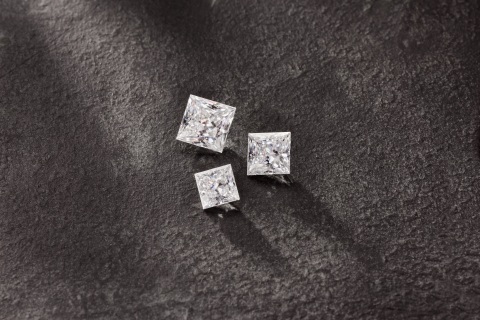 For more information about Charles & Colvard Forever One moissanite, please visit www.charlesandcolvard.com.